I am a wood turning snob. I admit it. It took me ten years to get reasonably good at turning and I still am disheartened when I see someone who turns better than I can (think Mike Mahoney, Peter Galbert). I took all the classes. I worked at it long and hard. I bought all the books. I still buy the books, and I am still hoping to get better at my craft. Anyone who wants to call themselves a wood turner should have to go through what I went through – there are no shortcuts and there should not be. All that said, I resent it when someone calls their tools “easy”. It is not easy – let everybody else pay the price as I did. Buy the books, take the classes, practice for hours and hours. It is not supposed to be easy – if it were easy, than everybody could do it. With all that in mind, you can imagine my thoughts when I came across the Easy Wood Tool turning tools at the High a few weeks ago. 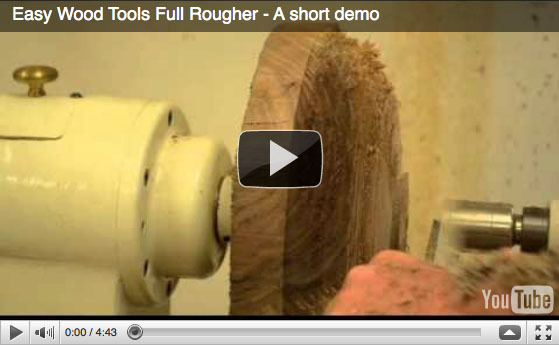 These are new turning tools sold as easy to learn and easy to use. Yeah, right!! Snobbery kicked in. Nonetheless, I got my hands on four of them to try out for a few days. Skeptical and snobby as ever, I set up a big round piece of tough walnut crotch on the Oneway. I pulled the large roughing tool out of its case and very carefully and delicately eased it up to the walnut. Every tool says right on the label to use the tool level and parallel to the floor and stick it straight into the wood. That is exactly what I did. I put it up there and stuck it right in the wood fully expecting some catch or kickback. Nothing happened. At least nothing bad happened. Small cuts at first and then as I gained confidence more and deeper cuts and pretty soon there were chips everywhere. I’m convinced. I must say that was the “easiest” bit of turning I have ever done. There is a whole group of Easy Wood Tools. The one I used for this review was the large roughing tool. 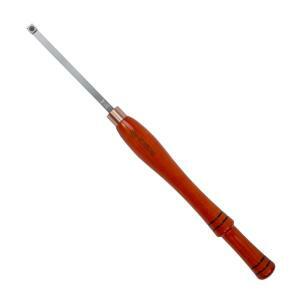 It comes from the factory with a solid steel shaft and a substantial beautifully shaped and finished wooden handle. The cutting edge on the large rougher is a square piece of carbide sharpened on all four edges and mounted to the end of the shaft with a set screw. When one edge dulls, simply rotate the cutter to a new sharp side and continue working. When all four sides of the cutter are dull, the cutter is replaced. I am impressed with these tools so far. Take a look at the video below and also go to the Easy Wood Tools website to see how to use the tools. If you are a beginning wood turner and don’t want to spend a large amount of time learning the other traditional methods, then these are the tools for you. If you are a traditional turner with many hours of experience, you will still like these tools for their extremely easy (there, I said it) use. You can throw some chips fast and easy with these tools. Give them a try. And be sure to take a look at the video below if you still aren’t convinced.